New York City has been called the center of the universe. For chefs and restaurateurs it is the mecca for the best talent to be found and a place for aspiring professionals to earn their chops, refine their talent and build their personal brand. New York is also very tough on cooks. The best restaurants are in such demand by young cooks that many agree to work as a stage’, dedicating countless hours for little or no money in exchange for knowledge and a resume builder. Thousands of cooks look to cut their teeth in New York while others might enter the New York landscape having built their skill set elsewhere and now seek approval from a very discriminating dining public. There are nearly 25,000 options in the boroughs of New York for guests to find a restaurant meal – an incredible amount of competition. In this type of environment the strong survive and the weak shall perish. I find that it is always fascinating to follow young cooks who have the passion, the commitment and the patience to set a path from learning how to cut an onion to plating some of the most sophisticated food to be found on any table. The shear dedication and determination necessary to ride the train from point A to point Z can be hard to imagine with many bumps along the way. Those who make it – deserve it. I have had the pleasure to watch many young culinarians reach their goals and feel for even more who falter along the way leading them to seek a different career path. One who has followed his dreams and continues to impress all who know him and enjoy his food is Chef Tyler Scott. He agreed to this interview as an opportunity to demonstrate a path for others. He is an inspiration to me. 1. What or who influenced you to pursue a career in food and beverage? “I would have to say my mother and aunt. Growing up, even though she was working full time, my mother still made time to produce bread, and pastry items from scratch as well as can jams from all the summer berries. We didn’t have many traditions or family rituals but I always looked forward to cinnamon rolls at Christmas and strawberry short cake well into long Western New York winters. My aunt, on the other hand, taught me the importance of being specialized and that if you are liberal with the use of anything let it be butter. She only cooked three things: French toast, Snicker Doodles, and city chicken, but all of them were uniquely hers in some fashion and delicious”. 2. Who mentored you in your pursuit of this career? 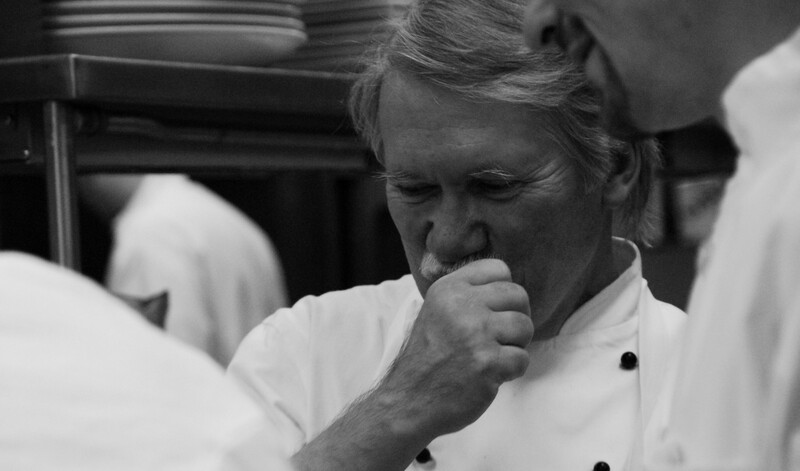 “I worked for a number of talented chefs over the years but two really guided me: Brian Skelding and Michael Powell. Chef Skelding instilled the foundations of cooking in me. Then later in my career Chef Powell schooled me on management and leadership”. 3. How would others describe your style of management? “I believe that others would describe me as being fair and understanding with a strong emphasis on educating the people we employ”. 4. Do you have a business philosophy that drives your operational decisions? If so, can you describe this philosophy? “Teamwork – I strongly believe that working as part of a cohesive unit is a crucial part to being successful”. Chefs quickly realize that there is less room for individualism in kitchens than one might think. There are way too many tasks to accomplish, far too many variables that can distract and enormous pressure to be ready for anything and everything to even attempt to work without the complete cohesive nature of a team. This goes beyond “teamwork” and parallels the relationship that a successful sports team would encounter. All for one and one for all is the motto that kitchens live by. 5. Can you name a particular food experience in your life that was your epiphany? An experience that stands out as the moment when you said, yes, this is what I need to do. “My first job after graduating from Paul Smith’s College was at The Greenbrier Resort in White Sulphur Springs, West Virginia. I worked more and with more intensity during my time there than I ever had before in my life, but the first time I really held down a station on the main line and felt that rush of adrenaline I was hooked”. 6. What is your pet peeve about working in the food and beverage industry? “The never-ending debate over meat temperature correctness drives me nuts. It is comical as well as irritating, especially in an age where chefs are so popular and information so accessible. This may appear to be a small thing, but it seems impossible to find two people (cooks or guests) who can agree on what medium rare looks like”. 7. Who are your most valuable players in the operation where you currently work? “Hands down Oscar. We have a small staff at Ze Café and it is easy to see when someone is not pulling their share. Oscar is young with no formal training prior to this job, but you can see that he understands the foundations of what makes you successful as a cook on a daily basis”. 8. If you had an opportunity to provide some guiding light to young cooks, bakers or hospitality students looking to make their mark in this business, what would you tell them? “Hard work pays off – period. Also, when the time comes and someone gives you a shot – have a clear idea of what it is that you want to do and how you are going to do it”. 9. When you hire people to work in your business what traits are you looking for? “I look for a positive outlook on life, adaptability, and a willingness to learn. A positive outlook is huge for me in the work place, I try to smile and keep a bright mind set. This attitude helps with productivity and creates a more pleasant work environment. So I try to employ people with a similar attitude”. 10. If you were not working in food and beverage, what would you choose to do for a career? “I would choose something that would keep me in close contact with the outdoors. I am an avid fly fisherman so maybe a guide”. 11. What would you like people to know about your current business and the products that you produce or sell? “Ze cafe is a small restaurant with a French influenced menu. We focus on freshness and quality of product. During most of the year we are privileged to receive fruits, vegetables, and eggs from our owners farm just south of Albany, New York”. “Born in Buffalo New York, Chef Scott spent his pre-college years working in restaurants. Upon graduating high school he attended Culinary Arts and Service Management at Paul Smith’s College. While at Paul Smith’s Tyler was the Co-captain on the school Cold Food Team, which received two gold and silver medals at the New York City Food Show. Shortly after graduating he was selected for the apprenticeship program at the Greenbrier Resort in West Virginia where he was immersed in the world of Classical French Cuisine. Returning home after three years, he worked as a Sous-Chef to Chef Scott Bova at The Athenaeum Hotel in Chautauqua, NY for the summer season of 2008. The following fall, Tyler moved to Portland, Oregon where he was able to pursue his interests in farm to table dining, butchering and Charcuterie working as a Sous -Chef under Ryan Bleibtrey at Urban Farmer Restaurant.